Mexican company Inventive Power helps industrial customers to reduce their energy costs, which in turn reduces pollution in major cities. 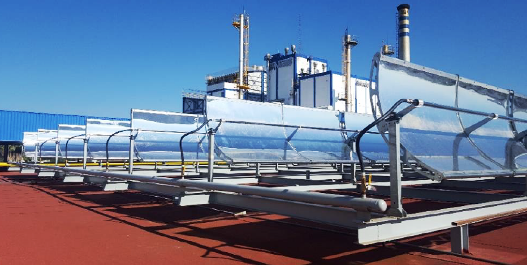 “Besides traffic, industrial boilers are responsible for much of the pollution in urban areas,” Ángel Mejía Santiago explained during the Intersolar Europe. The founder and CEO of Inventive Power emphasised that concentrating solar systems could offer energy at significantly lower cost than thermal power generation by natural gas or oil. Santiago sees great market potential in the technology, as there have been 32,000 boilers and water heaters installed across the country – at hotels and hospitals as well as food and beverage companies. The photo shows a parabolic trough installation with 433 m² of mirror aperture at the Nestlé dairy factory in Lagos de Moreno, central Mexico, which started operating in 2014. “Nestle is an interesting partner because the food producer decided to replace their fossil steam boilers gradually,” Aldo Agraz Huitron, CTO of Inventive Power, said during the Intersolar Europe side event Mexican Energy Transition: New Opportunities for Solar Technology & Business, organised by the German Agency for International Cooperation, GIZ. The provider of turnkey solar process heat installations had already completed a second project at Nestle´s factory in Chiapa de Corzo in 2014 (see the table below). Description of the two concentrating systems set up on behalf of Nestlé Mexico. Both installations were not subsidised. The generated solar heat is used for pasteurisation. The cost of solar process heat is significantly below the cost of boiler heat generated by fossil fuels, Huitron confirmed. The Power Trough collectors produce energy at an average 0.32 MXN/kWh (or 0.018 USD/kWh) based on a system lifetime of 15 years (see the table below) – a seventh of the cost of kilowatt hours produced by diesel boilers (2.2 MXN/kWh) and a fifth of heat generated by LPG boilers (1.75 MXN/kWh), according to a comparison made by Inventive Power. Inventive Power was founded in 2010 by Santiago and Huitron. The start-up received seed capital from two investors: Mexican venture capital business Angel Ventures Mexico and US-based non-profit organisation Endeavor which, by its own account, is leading the high-impact entrepreneurship movement in growth markets around the world. Inventive Power engages 24 staff and has installed around 35 solar process heat plants.